Who needs a TV for Mario Kart when you have a 200ft ice rink? I haven't really paid attention to hockey since, oh, EA's NHL '97 for the original PlayStation. 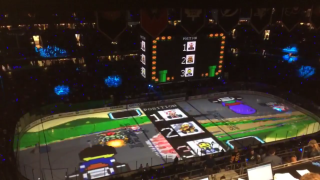 Still, I would've been happy to be in the crowd at a recent Tampa Bay Lightning vs Pittsburgh Penguins game, where the halftime entertainment was Super Mario Kart displayed on the immense, 200-foot wide ice rink. The match is fake, of course. The SNES didn't feature a guest appearance from ThunderBug, the Lightning's mascot, nor Iceburgh, the Penguins' mascot. But still, you have to appreciate the work that went into making it presentable and it shows that video games are everywhere. It also makes me want to invest in an ice rink so I can have some serious LAN parties. I'm sure it can't be too expensive, right?